Bask in the glory of this beautiful miniature painting of Durga, who is the Hindu Goddess who represents the power of the Supreme Being that preserves moral order and righteousness in the creation. The worship of Goddess Durga is very popular among Hindus. She is also called by many other names, such as Parvati, Ambika, and Kali In the form of Parvati, she is known as the divine spouse of Lord Shiva and is the mother of her two sons, Ganesha and Karttikeya, and daughter Jyoti. There are many temples dedicated to Durga’s worship in India. 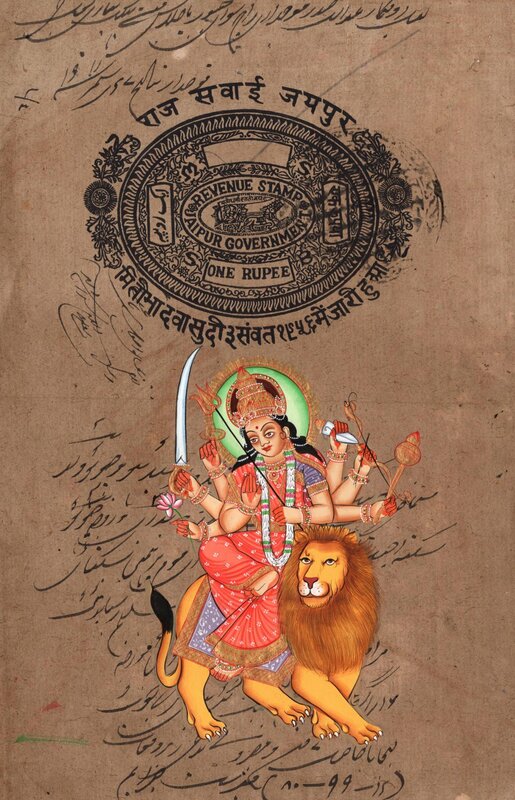 In this artwork, Goddess Durga is shown in a female form with the ubiquitous tiger (symbolizing unlimited power). She has many arms, carrying many objects in her hands that signify that she is always busy destroying evil and protecting mankind from pain and suffering caused by evil forces. There are many symbolisms associated with Goddess Durga. Order this artwork of Goddess Durga today, and bring home the motherly blessings.